New York is one of a handful of states to deny you your right to own a firearm silencer. That’s wrong and needs to change. In 42 of 50 states, it is legal to own a silencer for your firearm. New York is not one of those states. In New York, their sale or possession is illegal. They have been illegal for some time, but Andrew Cuomo’s 2013 NY SAFE Act upped the stakes and made it a violent felony and increased the jail sentence if you put a silencer on a firearm. A silencer, suppressor, or sound moderator is a device that can reduce the sound intensity, muzzle flash and recoil when a firearm is discharged. The names: silencers and suppressors, et. al., are synonymous. I’ll be referring to them as silencers. No matter what we call them, you should note something: silencers don’t silence or suppress the sound of the gunshot—not completely or even nearly completely. Some have attempted to say otherwise—claiming that silencers make the weapon “quiet” or truly silent. The Washington Post studied the issue and gave those who claim that silencers make guns “quiet” three Pinocchios (out of four; i.e., mostly a lie). Silencers seem like scary things. We see them in the movies when the bad guy uses one to cover up a heinous crime. But we don’t live in the movies. Our reality requires a bit more examination. We need facts and we need to use reason. There really is only one relevant fact as to why you should be able to purchase a silencer for your firearm: it’s your right. Just as with firearms in general, anyone who tries to justify laws prohibiting or curtailing silencers using the argument, “you don’t need one,” is attempting to speak for you—to live your life for you. In a free society, no one speaks for you. Your needs and non-needs are not determined by them or by a vote. It’s none of their business. In our country, where many of your self-ownership rights have been taken away, we at least have the Second Amendment guaranteeing the right to own a firearm; and a silencer is an accessory which does not change the basic function of your firearm. You are not required to justify why you need a firearm. You are not required to justify why you need or even want a silencer. In a free society, you are innocent until you commit an act of violence against someone else. It’s basic, common sense of Western civilization which gets lost in a frightened democracy where the Rule of Law has given way to the rule of the frightened mob. Prohibitions against rights create large numbers of criminals out of nowhere. We’ve seen this when busybodies have prohibited alcohol, drugs or just about anything else—most recently, the NY SAFE Act. We don’t need more such problems. You have a right to your firearm and its accessories. Your right to own and use a silencer is the end of the argument. Or at least it should be. But now I’m going to risk contradicting myself—for the sake of completeness. I’m going to discuss the fallacious reasons why some say silencers should not be legal and also justify why you may need or want a silencer. Let’s review the arguments many people use to say you don’t need a silencer and therefore can be prohibited from owning one. Mr. Myers is entitled to his opinion. He’s not entitled to his own facts which contradict reality. His statement is farcical on its face. There are many millions of silencers in the possession of legal gun owners and only the tiniest percentage have been used in an act of ‘violence against another person,’ as Mr, Myers would have you think. In fact, 99.997% are purchased for reasons other than to commit “violence against another person,” according to the U.S. Bureau of Alcohol, Tobacco and Firearms—given only 44 crimes committed each year using the 1.4 million registered silencers. And since there are surely millions more unregistered silencers out there, the crime rate is even much, much lower. In short, it almost never happens. Mr. Myers has been watching too many spy movies. He is trying to scare the public into voting to take away your rights using hyperbole which borders on the ridiculous. Sadly, his nonsense is working in New York. Another argument, put forth by New York Senator Kristen Gillibrand, is that the NYPD uses ShotSpotter technology which helps police recognize, pinpoint and respond quickly when a shot is fired. Silencers keep that technology from working. This may be true, but why should a farmer trying to remove predators off his land without spooking them be subject to the same laws as someone in New York City? Further, I think it’s quite logical to permit someone to prepare to defend themselves over the needs of the police who won’t arrive for several minutes. It’s not my desire to hinder the police, but nor should our laws be designed with the primary goal of making law enforcement officials’ jobs easier while taking a tool away from someone trying to defend themselves. On the other side of the argument are those in favor of permitting silencers. They justify the benefits of silencers by properly framing the safety issue. 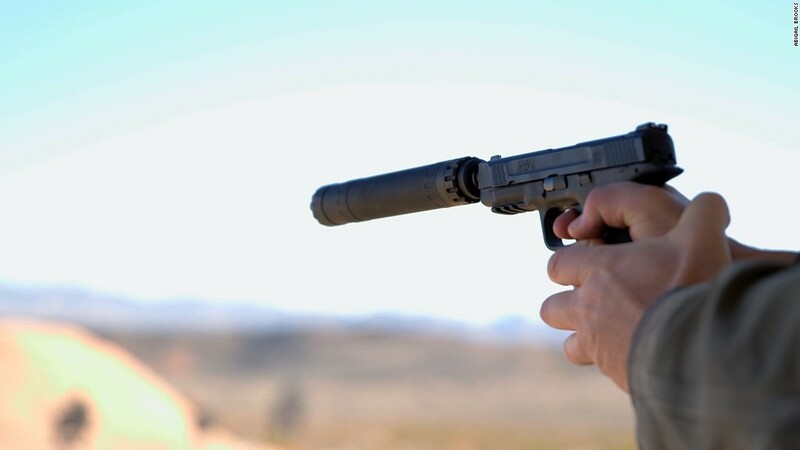 American Hunter magazine claims, “suppressors can negate the need to wear hearing protection, thereby increasing the shooter’s situational awareness . . . suppressors also reduce recoil and make the shooting experience more enjoyable. Plus, the use of suppressors disturbs less game and makes for happier neighbors”. Beyond hunters, other gun owners purchase silencers in order to be safer, as well—to protect their hearing and to protect the hearing of others. Gun owners purchase them to reduce recoil, to improve their awareness, to improve their aim and improve their shooting experience—making it safer for everyone. They want to be able to defend themselves from multiple assailants and a silencer assists. Yes, some people purchase silencers with bad intentions or use them to mask a crime. But such people are the vast, vast minority. We shouldn’t punish 99.997+% of firearm owners because a few people are violent. People were violent without firearms and that doesn’t change with the SAFE Act or any other prohibition. That’s because prohibitions don’t work. While state and federal appeals courts have sided with New York state and upheld the prohibitions in cases which have challenged the NY SAFE Act and other New York gun restrictions, there can be no doubt that such laws violate the Second Amendment as they infringe upon the People’s right to own a firearm. It’s unfortunate that the judiciary has failed to protect our rights. We must look to democratic institutions to get back our rights. That involves electing Larry Sharpe as governor of New York. 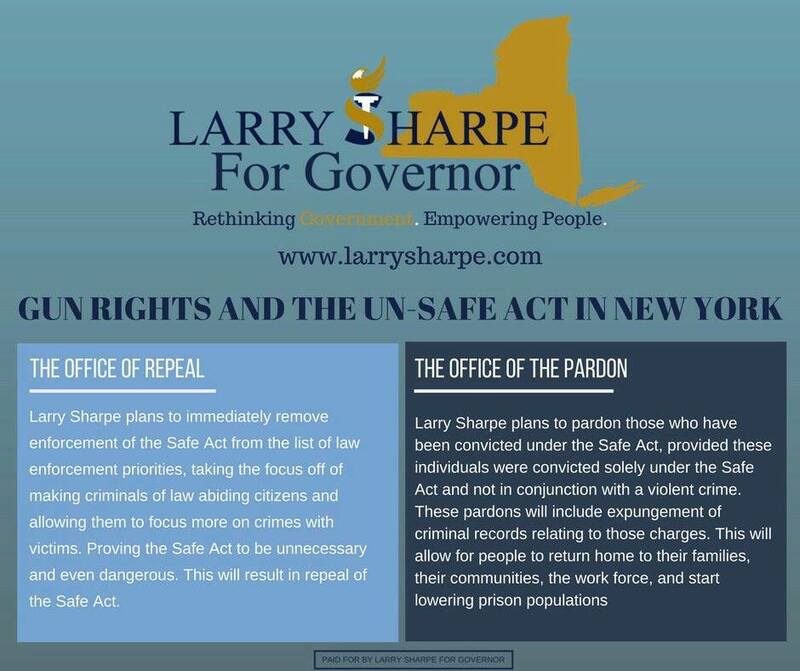 Sharpe has a plan to pardon those wrongly convicted of violent crimes who have, in fact, committed no act of violence. Sharpe has a plan to reverse the damage Andrew Cuomo’s SAFE Act has done and work with the legislature to overturn our unconstitutional gun laws. I spoke to Larry Sharpe on this topic and he made the point that he doesn’t want the debate to be about which pieces of equipment are good or evil. He believes that’s arbitrary. He favors the Second Amendment in order to protect a person’s First Amendment rights. And he favors firearm accessories which make the weapon easier to use or make the gun owner more comfortable handling the weapon when defending herself or himself. Whether you’re defending your rights guaranteed by the Second Amendment, defending your right to be presumed a non-criminal, defending your right to self-protection, or you are in favor of safer handling of firearms, it’s clear that silencers should not be prohibited. The case for prohibition does not withstand any one of those arguments, once fear is properly removed from the equation. Getting past fear is the key to restoring rights and improving our lives. Well stated case. I agree completely with the author. Silencers?! Really?! How about a repeal of safe act so I can bring my AR-15 back to NY without worrying about being criminalized. Your gonna have to try harder to get my vote. Larry plans on repealing the SAFE Act and creating an office of the pardon to pardon those unfairly affected by the SAFE Act. He’s going to do that too. Dig a little deeper and you’ll find everything you’re looking for. Sounds like a plan to me. The SAFE Act will be gone by 2020 and we can finally own suppressors or what Hollywood has termed “silencers.” It would actually be nice to go hunting without hearing protection! With less recoil your aim will be much more effective – less ammo wasted. Ammo is expensive these days – imagine the savings there!